OK. I’m not really that bad at spelling, although daily I make small sacrifices to the word processing gods to thank them for the gift of spell checking. It’s just that I’m up to the K in my sort of self-imposed alphabet themed post title thingy, which I haven’t done for a long time. So work with me here, OK? It all started because Kathleen and Bobbie both bought the same roving at OFFF and had Sharon of Stitchjones dye it in the same colorway. Kathleen and Bobbie thought it would be fun to both spin the same roving and then knit it and then compare to see what they both came up with. So, for several week, the Wednesday night Sip-N-Stitch crew were treated to little peeks that were carefully hidden so that Neither Kathleen nor Bobbie would see what the other was doing. 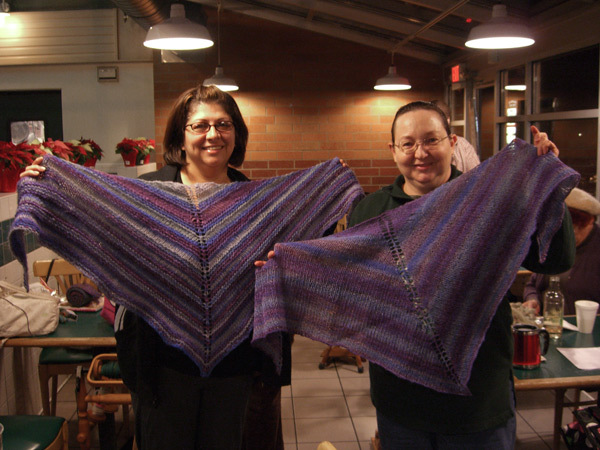 Strangely enough, they both picked the same triangular shawl pattern to knit. Great minds think alike, and all that. Last Wednesday was the great unveiling where we all got to see the finished objects side by side. Kathleen went for a stripey sort of look, and Bobbie went for a more heathered appearance. But aren’t they both lovely? You can find out all of the nitty-gritty that I don’t know because I’m not a spinner over at Bobbie’s place. No, I’m not going to start spinning. Don’t ask. Oh, no, me neither…there’s too much waiting for me to KNIT! But wow aren’t those lovely? I believe the correct phrase is, “I’m not going to start spinning _yet_.” Really, if you’re hanging around with them it’s only a matter of time. Come on over to the dark side. We have cookies! They fed me cookies last night and forced me to ogle all of their fiber — and even pet it. It didn’t work. I know what happens. It’s a slippery slope.